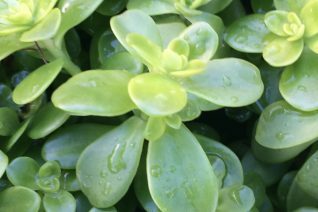 One of our favorite trailing succulents for containers. This is a half hardy Sedum (Zn8b) that will persist in most gardens most winters. Rolly poly emerald green foliage takes on dramatic red tints- especially on the older leaves. To 6″ tall and 20″ wide in a season. Rich, WELL DRAINED soil with light summer water. Full sun to part shade. I don’t think I’ve ever seen it bloom and I don’t really care. Trails 1′ over the edge of containers. Mix with other succulents or low water perennials such as Erodium or Scutellaria. Excellent performance at the Oregon coast. 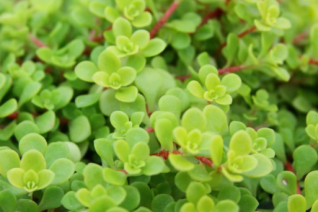 Immensely useful, if rambunctious sedum that glows in vivid gold to chartreuse. The needle like leaves are vivid and line trailing stems. The stems root where they hit the ground- good local solution for erosion. Fast growing plant that spreads indefinitely in sun to quite a bit of shade. So easy to grow that I suggest you plant it in AVERAGE well drained soil. No need for amendments because the truth is once you have this plant you will always have it. Evergreen. Easy to remove from unwanted places. Simply pick it up off the ground and dispose. Or move it. I use this plant as a fast low water place holder when I’m deciding what to put in next. To plant simply toss it on the ground and water. You can bury it a little but its really not necessary. Avoid strongly compacted soil. Yellow flowers in early spring. Nice ground cover under trees. Hardy. Oh, so hardy. Interesting small yellow Sedum from Japan that is from a summer rainfall climate. That means that it likes consistent water in the summer. Good drainage is key and this plant performs a valuable role as the glowing understory to woodland perennials and shrubs. Rich, well drained soil with regular summer irrigation in part shade to shade. Bleaches to almost white in full sun. Early spring flowers are yellow and brief. Excellent as the lower level of a summer planting. Evergreen and easy. Aerate the soil well by double digging and incorporating oxygen into the soil before planting. 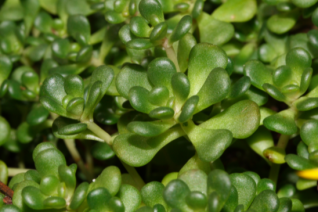 To 3″ high and spreading to more than a foot wide in a season. 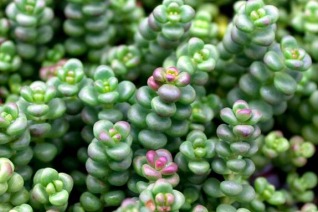 Useful and pretty evergreen Sedum that thrives in diverse biomes but always looks good. In dry dappled shade it will create a dense spreading deep green colony. To 5″ tall by several feet wide. In full sun it will grow a little slower but regular water will speed things up. The bright green rosettes of leaves are perched atop stems. In early spring the whole plant is awash in gold flowers and attending pollinators. Rich, well drained soil with light but consistent summer water. The more shade the less water is required. Nice ground cover for small areas. Dense and evergreen. Surprisingly cold hardy and amenable to life in our climate. Mexico. A really good Sedum that I got from a friend who collected it on the Iberian Peninsula in the Spanish mountains. 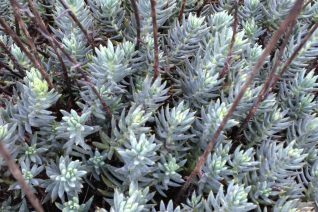 Very soft blue gray foliage is shaped like pine needles lining trailing stems. Forms a good ground cover very fast. In summer 10″ vertical stems support clouds of soft off white flowers. Very different from so many other Sedums that bloom yellow. This soft color is very effective in the garden and of course draws pollinators from miles around. When spent the stems remain erect and turn gray- they may easily be collected by simply giving each a soft tug- or a whole a handful and they will break cleanly. Full sun to very light shade. Average to enriched soil that is not compacted. Good looking year round appearance. Not quite as dense or prolific as Sedum reflexum but still good. Slopes, between shrubs, as competition for weeds. Roots along the ground as it grows. Moves with ease and may be used as a temporary place holder while you think of what to plant next. Simply scoop up the foliage and move it to another place. Actual planting is not necessary. Share with friends. Great in seasonal as well as winter containers. To several feet wide. Light summer water or none when established. Easy plant. Pine Sedum is common in the rocky outcrops of foothills and mid-elevation mountains throughout the state. You’ll find it clustered around crevices and on scree at the base of cliffs. Fine stems support clusters of deep green pine needle-like foliage. In summer its crowned by clusters of deep yellow flowers. Not as showy as other native Stone crops but pretty none-the-less. To just 3″ tall and forming clumps to 1′ wide. In the garden give it enriched, fast draining soil with light, consistent summer water- this improves the overall appearance. 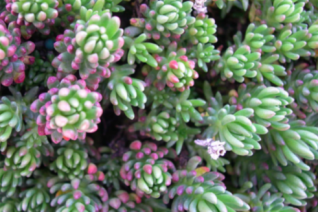 An interesting native Sedum for containers, rock gardens, borders, dry gardens. Evergreen. Very cold hardy. Oregon Native Plant. Not hard to tell where this stone crop is endemic. It resides mostly in the middle elevations of the western Cascades. Rocky slopes, cliffs, and road cuts is where you find the clusters of small green rosettes that makes large colonies. In summer 4″ stems arrive topped with bright gold/yellow flowers- a pollinators dream. Little spreading plant to just inches high but expanding to several feet wide in well drained, somewhat enriched soil with light summer water. Full sun to quite a bit of shade. Forms a dense mat and may be used as a small scale weed blocking ground cover. Easy to grow plant. Roots into the ground as it spreads- evergreen. Oregon Native Plant. 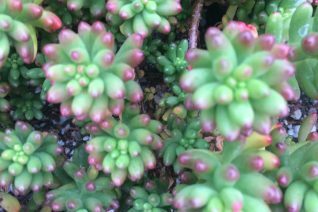 Oregon native Sedum that is found at mid and high elevations of the Cascades. It makes its home on recent road cuts and rocky, gravelly cliffs. 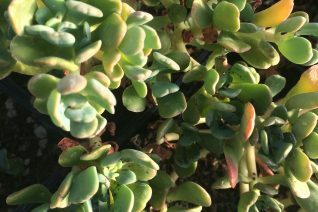 Small rolly polely green succulent leaves line trailing stems. Very juicy. 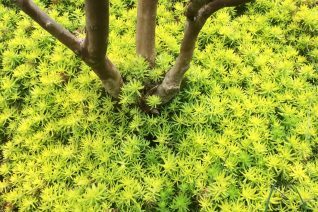 Forms a thick evergreen mat in full sun to part shade in well drained soil. Excels in enriched soil that also drains. Light to regular summer water to retain luster otherwise completely adapted to summer drought. Rock walls, containers, rock gardens. Easy to grow native that is one of our most attractive stone crops. In late spring 4″ stems rise with clusters of bright yellow/gold star shaped flowers. As with all Sedums they are coveted by pollinators. Takes on red tints in cold weather. Evergreen. Oregon Native Plant. 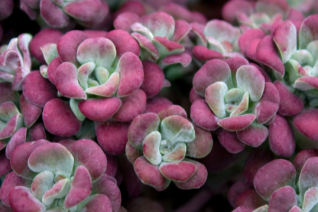 There are so many great native Sedums that it can be hard to choose? But why choose when you can have them all. This little succulent creeper is most often seen on rocky slopes in the western Cascades. It occupies the hottest regions but sends its roots between the cracks in the rocks to absorb moisture. In summer 4″ spikes hold boisterous gold flowers- adored by pollinators. Spreads very slowly to about 3″ tall and 1′ wide. Adapts to rich, well drained sites with light to little summer moisture. Excellent in rock gardens, slopes, among small drought adapted shrubs. Very easy to grow. This form is from the central Oregon Cascades. Oregon native plant.